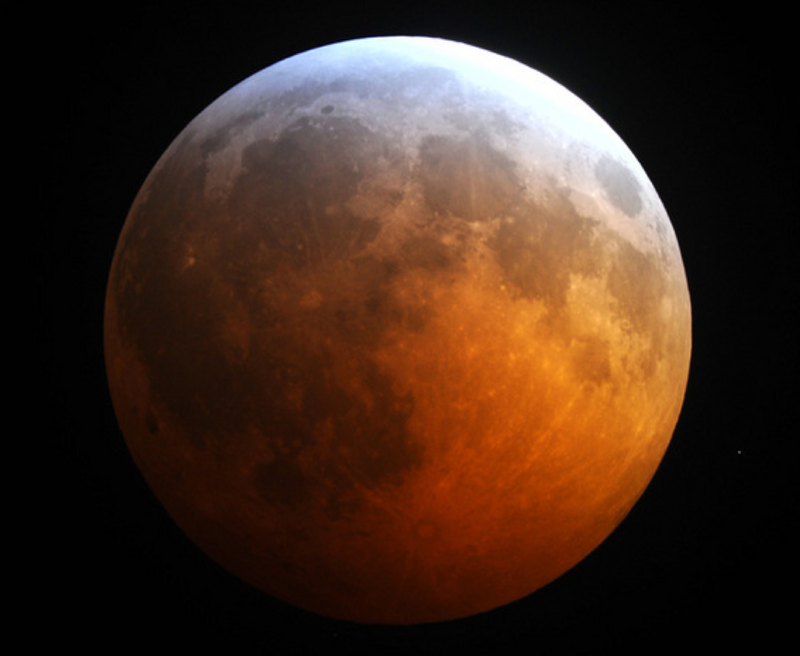 There is some confusion as to when you should start watching the total lunar eclipse – known as a blood red moon – that is listed as occurring on April 15, 2014. Actually, in most places where it will be visible, you should start watching on April 14 – that’s Monday evening! But if you are watching in Chicago, Dallas, Denver, Los Angeles, Seattle, San Francisco, Honolulu, etc, the eclipse starts before midnight on what is still Monday evening, April 14. To be clear: For L.A., and other points in the Pacific time zone, the eclipse will begin and reach totality just at the stroke of midnight on Monday night, and then continue into the wee hours of Tuesday morning! You won’t see much for the first hour, but then into the second and third hours, the moon will darken gradually until it becomes a totally reddish disk. Then the process starts to wane, and about two to three hours later, it will be over. 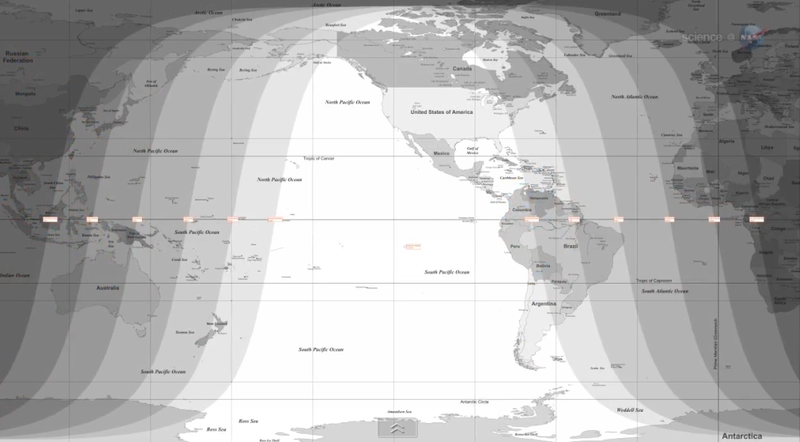 The eclipse will be visible in much of the Western Hemisphere, including North America, Central America, the western half of South America and the islands of the Pacific Ocean*. Why does the moon appear red? It has to do with the bending of light rays in the atmosphere. Eclipses occur when the Earth moves exactly between the Moon and the Sun; the Earth’s shadow covers the Moon. Most light is blocked, but some red bounces past, and seems to project itself, like a sunrise or sunset, coloring the Moon. If you miss this eclipse, don’t despair; another one is coming October 8, and that one will be visible in much of the same area – although the prime viewing area will shift a bit to the west, so that it includes some of Asia. Of special note with this April 14/15 eclipse: Thus begins a series of four consecutive blood-red moons, called a tetrad – each separated by a period of six months which is, according to legend, a sign of the coming of the Apocalypse. Check back here in two years, and we’ll see how that turned out. (*The eclipse will also be visible in Australia and New Zealand). « RUSH Trivia: Who Played JOCHEN MASS? The events over 2014 and 2015 is NOT seen by Christians as a sign of “the coming Apocalypse.” It is seen as a sign from the Creator of the Universe that World history is lining up for Russia and Iran to march against Israel causing disaster to Europe and having direct impact on the rest of the world. the Creator has promised that Russia and Iran will experience fire and rocks from the heavens to fall upon them and cause them to be defeated. (Ezekiel 38:22) While we await the “Rapture of the Believers (which is NOT the Second Coming) and the Second Coming (Revelation and Matthew 24:29), “No one knows but the Creator when that will happen.” We are not to believe anyone predicting the date of these events. (Matthew 24:36). You people crack me up. The bible is full of great stories.. but that’s all they are, stories. Completely a work of fiction from people who did not know how to explain the world around them. It’s sad and demeaning that people in this day and age still listen to this rubbish. It’s going to destroy our society. Nah, the dead head Democrats have already done that. Hey I’m 14 and I just wanted to tell you that you may look at them like stories, but when you actually read the bible (Revolutions) it shows signs that are happening now for example in the bible it talks about how there will be earthquakes and tsunamis that will shake the Earth. You may say that has been happening for centuries but now they are worse and weren’t there rumors of war last year that was also something said in the bible. So why do you deny these things. God will come one day it may be tonight, tomarrow, maybe as you read. You always have to be prepared. You say we crack you up but when that day comes your not going to be cracking up. Trust me God is real crack up all you want, but I encourage you to read the book of Revolutions and go to a church and you will truly see the power of God. If you are thinking of things to tell me now, read the book and then tell me how you feel please. -this is from someone who cares about you even if I don’t Know you. Can YOU explain the world around you? Can science? Simply put, no. I would rather believe I was created from the image of God, than from a micro-organism of a meteorite or asteroid or a monkey or whatever you evolutionists think you came from. Plus, the free gift for us in believing Jesus, the Son of God Himself, is eternal life. What gift do you get for believing your evolution religion? Pride that your ancestors are monkeys? And I call it a religion because you need faith to believe in something that cannot be proven with our little minds. Before you spam me with your ‘crazy Bible believers’ thoughts, read the Word of God (especially the book of Revelations) and then spam. You’ve never read the Bible and you hate us for it? We’ve read Darwin’s ‘theory’ of evolution and laugh at it. According to Ezekiel 38 (KJV) “Persia, Ethiopia, and Libya”(Ezekiel 38:5) are the only named parties involved in whatever is being mentioned (whether it already occurred or not) besides Israel and Gog/Magog (which are referred to many times in the Bible as different individuals, cultures AND regions), so keep an eye out for a flotilla of North African troops moving across the Mediterranean. I understand the extrapolation of Iran from Persia, where Russia fits into this is really beyond me here… Also, it should be noted that it was stated that this army was “a great company with bucklers and shields, all of them handling swords” (Ezekiel 38:4)… so I’m sure that the standing military in Israel armed with tanks, RPG’s and automatic weapons will be able to take care of an army of swordsmen pretty easily without the need for fire and brimstone. To be completely fair to ALL Christians, there is nothing in the Bible that directly states what you claim “Christians” believe, even in your referred passages. This is one of many interpretations of the concepts and figures presented. There is nothing inherently wrong with any of this, anyone is free to (and will) interpret the Bible as they see fit, but to state that this is what Christians believe is a blatantly false blanket statement. Remember Matthew 7:15 “Beware of false prophets, which come to you in sheep’s clothing, but inwardly they are ravening wolves.” For one to twist details of a happening in the Bible and present their interpretation as Divine Truth sounds a *lot* like false prophecy to me. Just another perspective, take it with a grain of salt, abandon it if you will: if this interpretation is right, thousands of people die horrific deaths by fire and brimstone, if it’s wrong then… nothing happens. I’ll side with the theory that doesn’t involve mass murder. Well said. Only God knows the future. The maximum point of the eclipse is April 15 at 5:46 PM, Sydney time – which I believe is the same time zone Queensland is in. So you will barely see it. what time to watch it in Philippines? Sad to say you won’t see much, if any of it, in The Philippines. In Utah, it will look FABULOUS! Will it be visible from France, if so when?? Sorry, France misses out on this one. When is the best time to see it in Weisbaden Germany? You are outside of the area that will be able to see it, unfortunately. Will we see it in Cyprus around 2am ? Sorry, Cyprus is too far east for this eclipse. Getting an interesting view of it here in Cyprus though and can see the Red Glow at the Top and what appears to be another Moon behind it rising – which i know is illusion ! Noting Bible references and being a Zen Buddhist myself – i note that World events are making big changes here in this little part of the World , with USA Boats near Russian ones in the Med , Turkish Troops on standby , Ukraine under pressure and Syrian Forces still fighting , its not rocket science to see that geographic changes will happen ! Still if Cyprus can lose its Green Line that divides the country from North to South i will be happy . I live in Myanmar. Would I be able to see the blood moon in Yangon? It will be just below the horizon for you, unfortunately. You will be able to see a little bit of the Oct eclipse, though. What are the timings for Pakistan? We are. at 12 houra difference from LA. You won’t be able to see it, I’m sorry to say! Yes! Please use the New York times listed here as your guide for watching! Sorry, dear Emirati friends, it is not visible in your area. will all of Florida get to see it cause we got partly cloudy at 2am thru the rest of the morning. All of Florida is in the zone of the total eclipse. BUT, for anyone who has lived there, those marine layer clouds could hide the party. Fortunately, the eclipse goes on for hours, and the clouds tend to drift by pretty quickly. Wait for a break in the clouds – you’ll get one eventually. Despite all the nonsense from major media, the red color is due to LOCAL smoke or dust conditions, and varies from place to place. It tends to look more red in big cities where pollution is a problem, but still its usual yellowish on clear nights. Don’t believe the crap you read in lame stream media. It has a basically reddish tint because of the bending of the light rays, as described in this article, but it can be darker or brighter red depending on local conditions – such as pollution, red dust (if you live in an area with red dust) and smoke. Yes! Although it may be just slightly less than 100 percent of totality. Will we in the philippines be able to see the oct blood moon? The October one? Yes. Check back here in September and I will give complete times and locations! Actually, it’s people like Nyla. Climate change should help..
will manitoba will be able to see it? 10:19pm in the Midwest, moon is full, and very white and bright! I am making moon water! The eclipse moon was NOT RED here. The red color is a local phenomena related to LOCAL fires or air pollution. Once again the lamestream (libtard) media was wrong, wrong, wrong. Check out the photo that I took…it’s in my next post on this blog. Red. Sorry, Bob, but the reddish color is more related to the fact that the light seen reflected off the moon during Total Eclipse is basically as though you are seeing all the sunrise/sunsets around the planet at once. ” During a total lunar eclipse, the Earth lies directly between the sun and the moon, causing the Earth to cast its shadow on the moon. Earth’s atmosphere extends about 50 miles (80 kilometers) above Earth’s surface. During a total lunar eclipse, when the moon is submerged in Earth’s shadow, there is circular ring around Earth – the ring of our atmosphere – through which the sun’s rays pass. Sunlight is composed of a range of frequencies. As sunlight passes through our atmosphere, the green to violet portion of the light spectrum is, essentially, filtered out. This same effect, by the way, is what makes our sky blue during the day. Meanwhile, the reddish portion of the spectrum is least affected. So, Bob, there can and will be many variations of what you will see during a Lunar eclipse, depending on the time and space from which the viewer is experiencing it. For me, it was a very nice dull red to bright orange in totality., and i photographed the entire event for over 4 hours last night. My husband and I are a bit confused by your article. We are in the Central Time Zone, US and are trying to figure out where our time zone fits into all of this. Would love to watch. It should be starting now! What about from monterrey, mexico?? Barbados should see about 90+ percent of it. At what time the Eclipse will start in Puerto Rico? I agree with Mitchell. It’s so sad that people believe in such insanity. The sad part is this: you believe in a god that will allow us all to die in a firestorm of unfathomable intensity. And you choose to believe in this god. For sane people like me there’s enough to worry about on this earth while we’re living; we don’t worry about what may happen after we die. That’s the definition of god-fearing. Organized religion is for insecure people. So cool! It’s red hot! Does anyone know if the future blood red moons will be visible to people in Germany? The next one, in October, will not.